Catharina was the oldest daughter of the diplomat Count Pawel Martinowitsch Skawronski (1757-1793) and Yekaterina von Engelhardt (1761-1829). She was educated at the Russian court. On 2 Sep 1800 she married the much older general prince Pyotr Bagration (1765-1812). Their union was unhappy and they had no children. After her husband had participatedin a complot against the szar they had to flee from Russia. After the czar was killed her husband returned to Russia in 1801 but Catherine was ill and stayed in Dresden. There she startted an affair with Clemens von Metternich (1773-1859) and in 1810 a daughter was born, Clementin Bagration (1810-1829). After Metternich returned to Vienna their relationship ended. They met again at the coronation of Napoleon. Her husband died in 1812 after he was wounded during the Battle of Borodino. During the congress of Vienna she accompanied the czar. Afterwards she lived in Paris where she had a literary salon at her house in the Re St. Honoré. Clementina lived with the Metternich family after 1814. In 1828 she married the Austrian nobleman Otto von Blohme (1795-1884). She died in Paris in childbirth in 1829. In 1830 Catharina married the British general and diplomat sir John Hobart Caradoc but she divorced him soon afterwards. She died during a trip to Italy in 1857 and was buried in Venice. 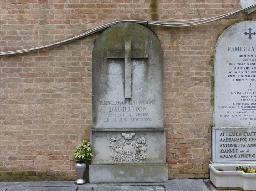 The grave of Catherine Bagration at the Cimitero di San Michele, Venice.